I don’t recall how many years ago I first heard of Amma, all I knew was she traveled the world hugging people. A couple of weeks ago I learned she was coming to Massachusetts, and was appearing about 20 minutes from my house. In fact she’s visited here each of the past eight years. Last Friday, July 10, was to be our first experience receiving a hug from Amma. I’d heard there could be long lines and that Amma didn’t finish until she hugged everyone present, at this point she’s hugged over 33 million people! 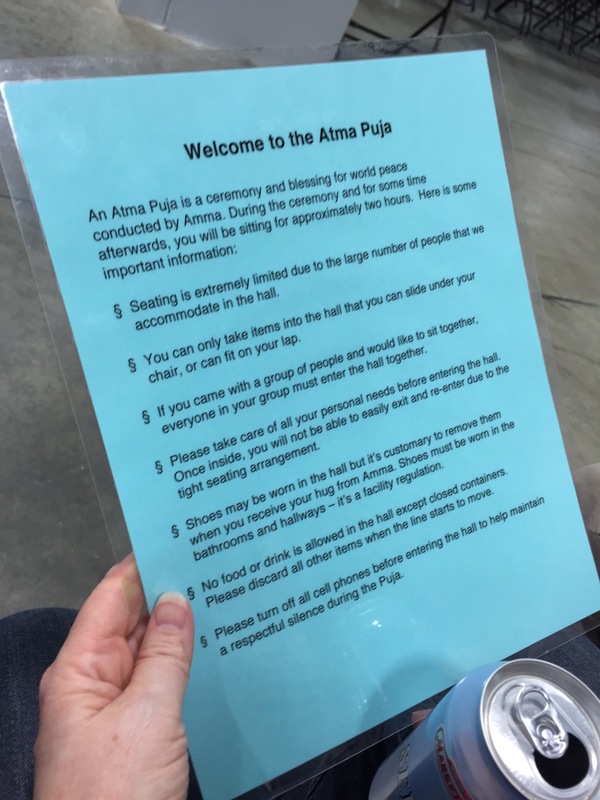 Lori and I got in line at 4:30pm for the program which began at 7pm with the Atma Puja, which is a ceremony for world peace followed by darshan, which is Amma’s embrace of each person. 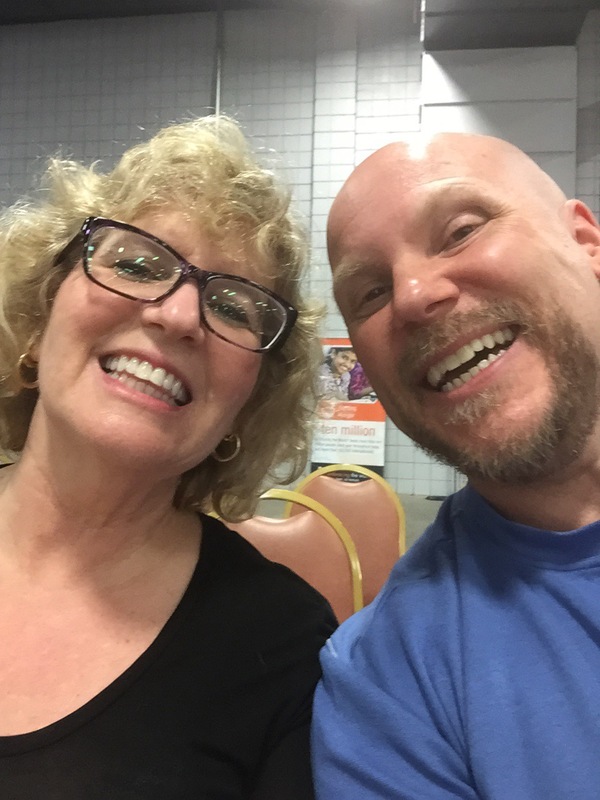 I feared we would be standing outside in the parking lot for hours, but we were quickly inside the hall with seats, food and lots of smiling people in a holding area. The energy was very uplifting and joyous. I felt sort of punch drunk and giddy just being there. We talked with the people around us, tried some great Indian food and had fun with some of the vendors. I learned that the vendors were not vendors, but volunteers from all over the country. One man pushing wraps with his homemade recipe was a software engineer from California. Around 6pm tokens were handed out and we got in line for the actual ceremony area. Each step felt like I was walking on the moon, or about to start floating away. It was really wild. A few times I was on the verge of tears, and a couple of tears of joy rolled down my check. The hours of waiting seemed to go by very quickly and it took me about 20 minutes to feel grounded and get used to the high vibration of the event. We sat in the fifth row and saw Amma enter the building and make her way to the stage. She spoke, taught, loved and prayed and it was very powerful even though it wasn’t English. Thankfully one of her people translated as Amma spoke of gratitude, expansion, and peace. After much meditation, humor, mantras and blessings Amma took part in an elaborate costume change and began her compassionate, motherly embraces, known as darshan. When it was our turn to get on stage it felt a bit chaotic and disorientating. Amma was sitting down and I approached on my knees. I got a very strong hug from Amma and a kiss on the head, then got another hug together with Lori. Amma is the most physically strong hugger I’ve ever come across. She also threw flower petals over us and gave us kisses of chocolate and of love. We also asked for a mantra from Amma which got us into another line and some more time sitting near her. That was my favorite part, being in her presence and watching the joy, the love, and the depth of emotion in the faces of people receiving hugs. Ages of huggees ranged from infants to a 93-year-old, and they all radiated… love and compassion. I could have stayed there witnessing all night. 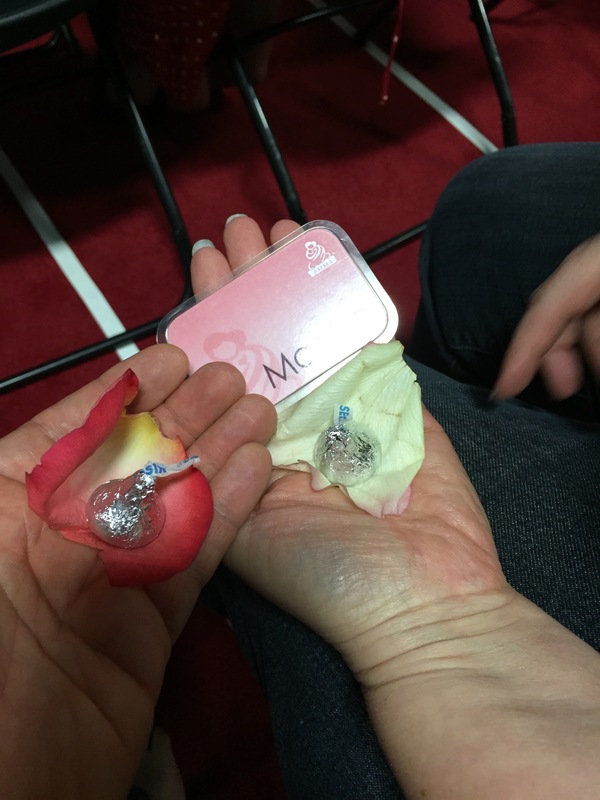 To receive a mantra, Lori and I each kneeled beside Amma and got a one-armed embrace, a kiss on the head, and a personalized mantra whispered in Sanskrit. Her helpers told us to keep our mantra private and gave us instructions on how to best use the mantras. It was close to 11pm when we finally left and I will definitely see her again. I look forward to being a volunteer next year and being part of the entire event. I was amazed at the amount of work Amma does for the world. She travels 8 months each year, and has raised and donated millions of dollars for humanitarian aid. I’ve been repeating my mantra multiple times each day for the past week and I feel blessed and supported on a level I’ve never been aware of. Amma rocks! 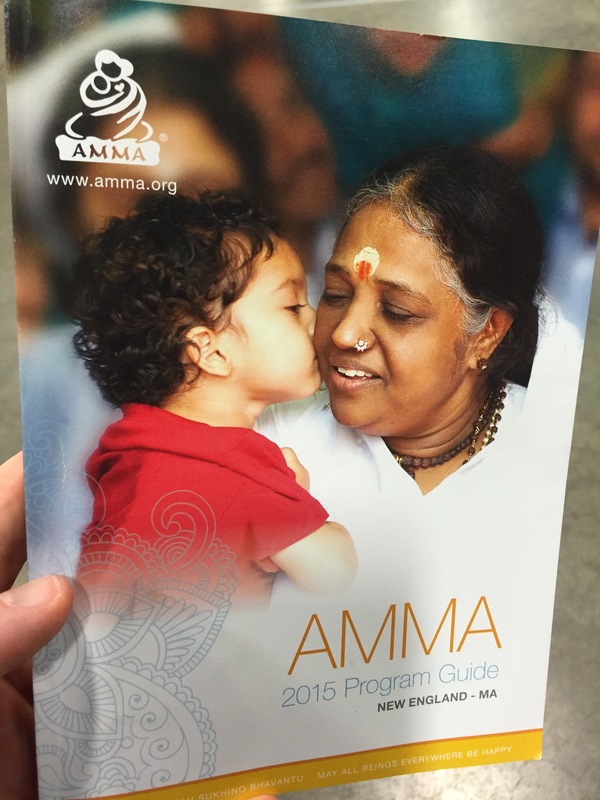 Leave a comment for: "Meeting Amma, The Hugging Saint"